We chartered a flight out of Marquette to photograph this lighthouse. The first time we flew in that direction we couldn't see it as there was fog in that area. 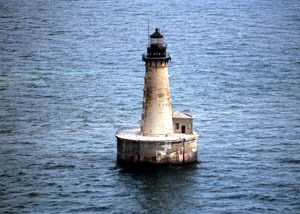 and photograph a few lighthouses. Finally, the last chance. We were running low on fuel. a twin engine plane took. What a surprise. And he wouldn't take a check or credit card. buy a coke or a hamburger. all U.S. Lighthouses. If someone know different, please let me know.